Here’s how a professional Entomologist searches her hotel room. I thought I would make use of my travel time to put together a new Ask An Entomologist post: a little primer on how to check your hotel room to see if there are bedbugs. It may just be because I go to entomology conferences where there are lots of presentations about bedbugs in hotels, but I’ve developed bit of a paranoid routine that so far has worked to let me sleep happily, and not bring any uninvited guests home. For facts about basic bedbug biology, I’ll refer you to this excellent publication from the University of Kentucky. So–on to the searching. Step 1: Look online and see if bedbugs have been reported where you are going. Do this when you’re considering where to stay and before you book a room. The Bedbug Registry is a handy place to start, but many other online reviews will have a mention of bed bugs if they are present. Step 2: Leave your luggage by the door when you arrive. If it turns out that the room is infested, why go all the way in? Luggage is one of the known ways that bed bugs are moved from place to place. So try to avoid picking up any hitchhikers. Another option is to put your luggage in the bathtub, if you can’t leave it out in the hall. Step 3: Case the Joint. Pay special attention to the bed, bed frame, and any headboard. These are the prime spots you’ll see signs of an infestation. Bedbugs hang out near their food source–you. Bedbugs don’t live on people permanently like lice. They are active at night, and need a place to hide during the day. 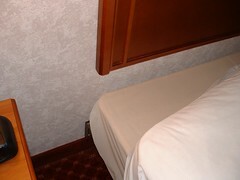 Headboards fastened to the wall next to the bed (common in many hotels) are a great place for a flat little insect to stay. After feeding, they poop, creating tell-tale brown stains of your clotted blood. You typically won’t see the bugs–they are fairly tiny and can scurry quickly–but you will see these stains. This second photo shows a severe example of what you are looking for. Step 4: Take things apart. Start by pulling the bed away from the wall, if possible. 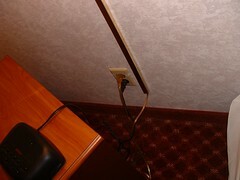 A flashlight is handy for shining behind headboards and under beds. Inspect the headboard and wall behind the bed. Any spots there? Strip the bed, right down to the mattress and bed springs. You have to see what’s underneath the clean sheets and mattress pad to know what’s been there. Lift the mattress and box springs up and look underneath. If it’s a platform bed, inspect carefully under the springs and around the base. Pay special attention to the seams of mattresses and the boxsprings. These are spots the bugs like to hide in. Step 5: Check everything else that could potentially harbor bedbugs. What the hey, you’re already paranoid, why not? Start with bedstands near the bed, and then check couches, drawers and furniture, and other items that are near the bed. Bed bugs can live in amazingly tiny cracks and crevices. I also check the closet if it has a luggage rack like this one. Step 6: Check the next morning. The last check is to look on your sheets when you get up the next morning. If you see little blood stains on your sheets, or tiny rusty spots….beware. Reactions to bed bug bites vary widely, from no reaction at all to lots of swelling and redness. You may be one of the people that doesn’t react with itching to the bed bug bites, so the presence of bites isn’t always a reliable check. Typically bed bugs leave bites in groups of three–but so do fleas, so that isn’t always definitive. So there you go. This isn’t a foolproof method, but it does let me sleep in peace. And so far, I’ve not seen anything that would keep me up. A potential employer once booked me into a motel for the night as I’d travelled a vast distance to be interviewed. One of the reasons I turned the job down was that it was very obviously a skin-flint operation as shown by the motel they put me in. I inspected my room in much the same way as you described and found not only bed bugs, but also fleas, cockroaches and body lice. (I won’t go into stains, quality of bed linen etc). Needless to say, I slept in my car. As someone who has firsthand experience with bedbugs having been brought into my home, I cannot stress enough the sage advice of this post. They are difficult to eradicate and will turn your entire home into a war zone. Avoid this it at all costs. Since traveling exposes you to this vulnerability and it is common in every hotel no matter how nice, clean, or expensive I recommend either keeping your bags (everything) in the lights-on-all-the-time bathroom ; the bugs don’t like light and won’t move in it unless desperate. Jokingly I think of them as little vampires (garlic won’t work :P ). In the same common sense vane, keep them as far away from the food (you) as possible. Laptops and such are the difficult thing to guard as you might want to work into the night. Be careful and work in the light; put those things across the room and wrapped up when you go to sleep. Also you could simply bring a large enough trash bag to wrap your luggage for the night. It’s a simple way to gain peace of mind and maybe sleep a little easier. If you are a professional that travels frequently, you might want to invest in a can of insecticide such as D-Force HPX (has an odor but it kills on contact and the best product I’ve used) which can be purchased online from the bed bug focused folks at http://www.domyownpestcontrol.com. There are other products and I recommend reading product labels & user comments before deciding which one to try. Lights on really won’t make much difference if they are hungry enough. Also, under the sheets, it’s dark. D-Force is Deltamethrin, which is relatively safe, but I wouldn’t over-use it. I always look up hotels on TripAdvisor.com–not just to see if there’s a bed bug review already, but to see how people like the hotel. Although any hotel can get bed bugs, and every hotel room should be searched, seeing bed bug reviews on TripAdvisor is a bad sign (and often means the bed bugs are quite obvious and still not being dealt with). I don’t know if you have seen this, but I thought it was so hilarious. Kids acting out Bill Bailey’s Insect Nation. Oh, I am never staying in a hotel again. Last year I was staying in a london hotel, about 3.30am I could hear clicking, so faint but.. yes there it is again… so I put the light on and all four walls were crawling with huge cockroaches ugh I felt so sick. I’ve got a friend who works in a 4 star hotel, only the lack of a lift robs it of 5 star status and she says the place is infested with fleas. Gross and informative. Makes me incredibly apprehensive about my next hotel stay…Which is tomorrow night. I guess the next installment should cover what exactly you are supposed to do if you find them in the morning. I think I could deal with one night of having them in a hotel – it’s taking them home with me that terrifies me. Ack! Just reading this made me itch. get a gecko…here in Honduras theyre fairly common, put a couple of em critters in your room and theyll eat all roaches, flies, mosquitoes and whatever else they can find. Love the gecko idea! In only fifteen minutes, it could save you 15% or more on itch-surance…or something like that. Thanks for that excellent and comprehensive post. I scan my sheets and pillows for them, but rarely check the underside, and I always throw the comforter right on the floor and never touch it. Good idea about luggage too. better to have my bags up on a desk or flat surface than leaning against the wall on the filty floor.